is the difference between a pixel and the Sistine Chapel. Deciding to spend the money on this trip was the hardest part of our Alaska trip. My wife DALOR (Did A Lot Of Research) and there can be no guarantees about what you’ll see. Our day highlighted that: we had thin ground-fog that limited visibility to a couple hundred yards. If the air was three degrees cooler, it would have been soup and we might not have seen anything; if it had been three degrees warmer and the fog burned off, we would have seen more and my photos would be twice as sharp. We flew to Hallo Bay, the site where the Discovery Channel’s “Great Bear Stakeout” was filmed. It’s apparently within a few bays of where Timothy Treadwell of “Grizzly Man” was killed. So, as far as locations go, this is the right place. We visited in late May, and were a little concerned about whether the bears would have come down yet, but as you can see, we had no problem approaching two on the ground. From the plane we spotted another bear, a large male, that we could not find in the mist and not seeing a dominant male was the only “disappointment” of the day. On our return flight we flew over another bay and spotted four bears. Our pilot and guide was Jarrod, who was great. He’s a young guy, but flies delivery and mail into the Alaskan interior in Winter, so extremely competent. He was very knowledgeable about the bears and their biology but it was his enthusiasm that really set him apart. Imagine flying and walking around with a happy Edward Norton and you’ve pretty much got the picture. We had excellent flying weather (we had zero turbulence, which I have to think was unusual, given the mountains) and the flight-seeing was great. We flew over snow-covered volcanoes with lava-heated lakes at their peaks and steam coming from vents and spilling down their sides, over glaciers spotted with brilliant azure melt-ponds, and saw a lone wolf trotting along a driftwood-covered beach. The plane was tight, naturally, but heated and everyone had a window (1 in the co-pilot seat, and then 2 rows of side-by-side). There’s a short but thorough safety briefing as well as a briefing on the protocol for hiking with the bears. Everyone is given a pair of hip waders and almost all the time on the ground is spent walking over mudflats, which is very easy. 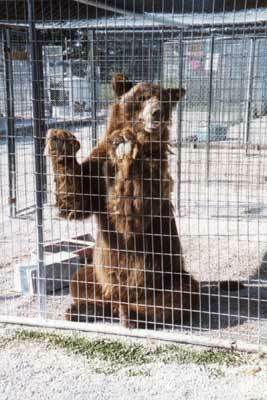 The hardest part is that, when viewing the bears, you kneel for long periods of time. The mud’s soft, but you get pretty stiff! The benefit is that the bears really, really don’t seem to worry about you. With both adult bears we saw them take notice of us, and I’d say that the mother avoided us initially (she took her cubs into some brush) but once they started feeding (the mother on clams, the other on lichen) they hardly glanced at us. We were close enough to hear the scraping of their claws and not just the squabbling of the cubs, but their growling complaints that it was time to be nursed. I honestly have no idea how long we were on the ground — a few hours anyway — and probably 80% of the time we were viewing bears. The thing that will either work for or against you is the environment: if you’re going to be disappointed by anything but highlight-reel footage of bears battling on two legs, maybe you’ll be disappointed. If it’s enough for you to closely watch magnificent animals in a magnificent setting, it may be the highlight of your trip. How Many Python Programmers Are There?